Postoperatively, mild to moderate anemia is usually treated with dietary supplementation of iron despite the unknown cause of the anemia. Ferrous iron is preferred due to its improved absorption over ferric forms. Taking iron with a meal is preferable to improve bioavailability and tolerance. However, calcium blocks the absorption of iron, as do coffee and tea, so counseling can encourage iron supplementation at times when these foods and supplements are not being consumed. Due to increased bone turnover in postsurgical Type 2 diabetes patients, the surgeons referring patients for nutrition assessments stress the importance of calcium supplements but fail to advise using calcium at bedtime to reduce interference with iron absorption. Nutrition counseling is not required post-surgery but should be strongly encouraged. When bariatric surgery patients were surveyed about their iron supplementation regimen, most replied that the side effects of the 325-mg tablet of ferrous sulphate (50–60 mg elemental iron) prescribed included constipation and hard stools before surgery, so they frequently stopped taking them within one week and never resumed after surgery. They were not aware that iron-containing foods like chicken and egg yolks would bypass the duodenum, where iron is absorbed, after surgery. None of them recalled being told they would need to monitor their iron levels for the rest of their lives. Folate deficiency is also a potential contributor to anemia in bariatric surgery patients due to restrictive and malabsorption issues.25,26 Symptoms include macrocytic anemia, thrombocytopenia, leukopenia and glossitis. It is believed that folate is absorbed throughout the small intestine, so deficiency is induced by reduced consumption of folate-rich vegetables and fresh fruits instead of malabsorption. Folate supplements (not folic acid) can provide necessary nutrients to convert inactive methyltetrahydrofolic acid into the active tetrahydrofolate acid needed for anemia management. Many patients exhibit clinical symptoms of deficiency even though vitamin B12 status is within the reference range.35 In a case of vitamin B12 deficiency, intramuscular or subcutaneous administration is the preferred route until stable levels are achieved with 1000 μg i.m./s.c. daily for five to seven days, followed by four to five weekly injections of 1000 μg.36 Intranasal and sublingual applications of vitamin B12 bypass the need for intrinsic factor, but further study in this area is needed. Numerous case studies from the survey of Type 2 diabetes mellitus bariatric surgery patients are included in Bariatric Surgery Patients —A Nutritional Guide.5 One that highlights the importance of setting realistic expectation s is a 32-year-old female on a basal-bolus insulin regimen whose surgeon told her the Type 2 diabetes would be resolved post-surgery. Two months postsurgical lab reviews confirmed that she still had Type 2 diabetes, so she would need to continue her insulin regimen and “accept her BMI of 41” in addition to monitoring her nutritional needs. Non-adherence to recommended dietary supplementation is a major factor in nutritional deficiencies for Type 2 diabetes patients pre- and post-bariatric surgery. This was demonstrated in the survey and reported by Modi et al., Brolin et al. and Andreu et al.37-39 Nutritional surveillance is an essential component in the management of Type 2 diabetes and bariatric surgery. 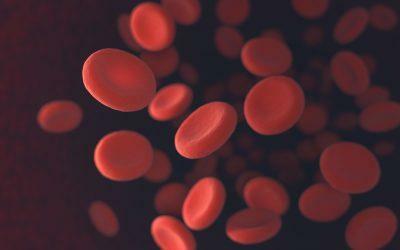 If patients are to maintain a good quality of life after surgery, nutritional deficiencies — including anemia management — must be assessed on a regular basis with patient education built into postoperative protocols. 1. Fuchs T, Loureiro M, Both GH, Skraba HH, Costa-Casagrande TA. The role of the sleeve gastrectomy and the management of type 2 diabetes. Arq Bras Cir Dig. 2017;30(4):283-286. 2. Guariguata L, Whiting DR, Hambleton I, Beagley J, Linnenkamp U, Shaw JE. Global estimates of diabetes prevalence for 2013 and projections for 2035. Diabetes Res Clin Pract. 2014;103(2):137-149. 3. Bluher M. Do adipokines link obesity to its related metabolic and cardiovascular diseases? Clin Lipidol. 2010;5(1):95-107. 4. Cancello R, Tordjman J, Poitou C, et al. Increased infiltration of macrophages in omental adipose tissue is associated with marked hepatic lesions in morbid human obesity. Diabetes. 2006;55(6):1554-1561. 5. Wedman-St Louis B. Overview of bariatric surgeries. In: Bariatric Surgery Patients—A Nutritional Guide. Boca Raton, FL: CRC Press; 2017:23-33. 6. Li JV, Ashrafian H, Bueter M, et al. Metabolic surgery profoundly influences gut microbial-host metabolic cross-talk. Gut. 2011;60(9):1214-1223. 7. Rubino F. Is type 2 diabetes an operable intestinal disease? A provocative yet reasonable hypothesis. Diabetes Care. 2008;31(2):S290-296. 8. de Lima KV, Costa MJ, Gonçalves Mda C, Sousa BS. 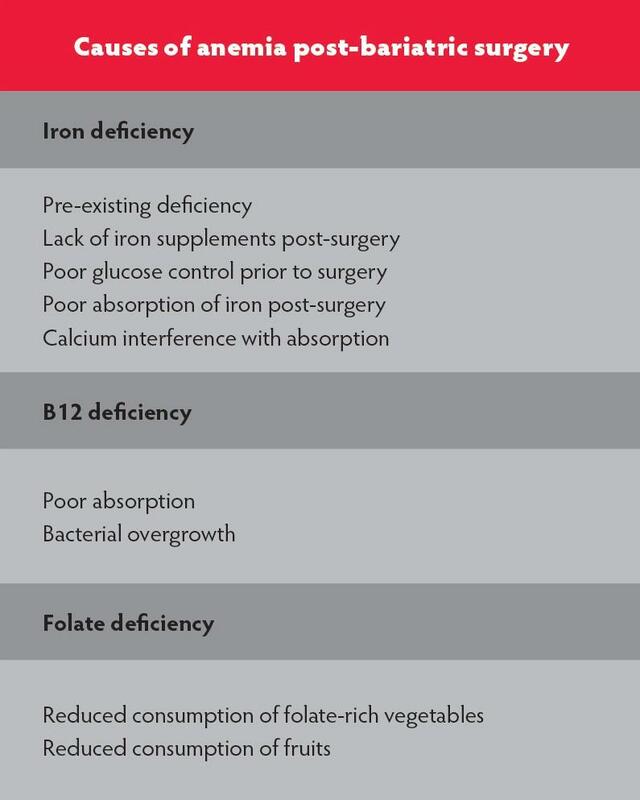 Micronutrient deficiencies in the pre-bariatric surgery. Arq Bras Cir Dig. 2013;26(S1):63-66. 9. Sahebzamani FM, Berarducci A, Murr MM. Malabsorption anemia and iron supplementation induced constipation in post-Roux-en-Y gastric bypass (RYGB) patients. J Am Assoc Nurse Pract. 2013;25(12):634-640. 10. Al-Mutawa A, Anderson AK, Alsabah S, Al-Mutawa M. Nutritional status of bariatric candidates surgery. Nutrients. 2018;10(1). 11. Lupoli R, Lembo E, Saldalamacchia G, Avola CK, Angrisani L, Capaldo B. Bariatric surgery and long-term nutritional issues. World J Diabetes. 2017;8(11):464-474. 12. Alexandrou A, Armeni E, Kouskouni E, Tsoka E, Diamantis T, Lambrinoudaki I. Cross-sectional long-term micronutrient deficiencies after sleeve gastrectomy versus Roux-en-Y gastric bypass: a pilot study. Surg Obes Relat Dis. 2014;10(2):262-268. 13. Vilarrasa N, Fabregat A, Toro S, et al. Nutritional deficiencies and bone metabolism after endobarrier in obese type 2 patients with diabetes. Eur J Clin Nutr. 2018 Jan 19. 14. Weng TC, Chang CH, Dong YH, Chang YC, Chuang LM. Anemia and related nutrient deficiencies after Roux-en-Y gastric bypass surgery: a systematic review and meta-analysis. BMJ Open. 2015;5:e006964. 15. Knight T, D’Sylvia L, Moore B, Barish CF. Burden of iron deficiency anemia in a bariatric surgery population in the United States. J Manag Care Spec Pharm. 2015;21(10):946-954. 16. Flum DR, Salem L, Elrod JA, Dellinger EP, Cheadle A, Chan L. Early mortality among Medicare beneficiaries undergoing bariatric surgical procedures. JAMA. 2005;294(15):1903-1908. 17. Still C, Sarwer DB, Blankenship J, eds. The ASMBS Textbook of Bariatric Surgery, vol 2. New York, NY: Springer-Verlag; 2014:83. 18. Crawford MR, Pham N, Khan L, Bena JF, Schauer PR, Kashyap SR. Increased bone turnover in type 2 diabetes patients randomized to bariatric surgery versus medical therapy at 5 years. Endocr Pract. 2017;24(3):256-264. 19. Knight T, D’Sylva L, Moore B, Barish CF. Burden of iron deficiency anemia in a bariatric surgery population in the United States. J Manag Care Spec Pharm. 2015;21(10):946-954. 20. Alexandrou A, Armeni E, Kouskouni E, Tsoka E, Diamantis T, Lambrinoudaki I. Cross-sectional long-term micronutrient deficiencies after sleeve gastrectomy versus Roux-en-Y gastric bypass: a pilot study. Surg Obes Relat Dis. 2014;10(2):262-268. 21. Muir A, Hopfer U. Regional specificity of iron uptake by small intestinal brush-border membranes from normal and iron-deficient mice. Am J Physiol. 1985;248(3 Pt 1):G376-G379. 22. Weintraub LR, Conrad ME, Crosby WH. Regulation of the intestinal absorption of iron by the rate of erythropoiesis. British J Haematology. 1965;11(4):432. 23. Huff RL, Hennessy TG, Austin RE, Garcia JF, Roberts BM, Lawrence JH. Plasma and red cell iron turnover in normal subjects and in patients having hematopoietic disorders. J Clin Invest. 1950;29(8):1041-1052. 24. Finch C. Regulators of iron balance in humans. Blood. 1994;84(6):1697-1702. 25. von Drygalski A, Andris DA, Nuttleman PR, Jackson S, Klein J, Wallace JR. Anemia after bariatric surgery cannot be explained by iron deficiency alone: results of a large cohort study. Surg Obes Relat Dis. 2011;7(2):151-156. 26. Shankar P, Boylan M, Sriram K. Micronutrient deficiencies after bariatric surgery. Nutrition. 2010;26(11-12):1031-1037. 27. Blume CA, Boni CC, Casagrande DS, Rizzolli J, Padoin AV, Mottin CC. Nutritional profile of patients before and after Roux-en-Y gastric bypass: 3-year follow-up. Obes Surg. 2012;22(11):1676-1685. 28. Skroubis G, Sakellaropoulos G, Pouggouras K, Mead N, Nikiforidis G, Kalfarentzos F. Comparison of nutritional deficiencies after Roux-en-Y gastric bypass and after biliopancreatic diversion with Roux-en-Y gastric bypass. Obes Surg. 2002;12(4):551-558. 29. Lachner C, Steinle NI, Regenold WT. The neuropsychiatry of vitamin B12 deficiency in elderly patients. J Neuropsychiatry Clin Neurosci. 2012;24(1):5-15. 30. Majumder S, Soriano J, Louie Cruz A, Dasanu CA. Vitamin B12 deficiency in patients undergoing bariatric surgery: preventive strategies and key recommendations. Surg Obes Relat Dis. 2013;9(6):1013-1019. 31. Murphy MF, Sourial NA, Burman JF, Doyle DV, Tabaqchali S, Mollin DL. Megaloblastic anaemia due to vitamin B12 deficiency caused by small intestinal bacterial overgrowth: possible role of vitamin B12 analogues. Br J Haematol. 1986;62(1):7-12. 32. Long AN, Atwell CL, Yoo W, Solomon SS. Vitamin B(12) deficiency associated with concomitant metformin and proton pump inhibitor use. Diabetes Care. 2012;35(12):e84. 33. De Jager J, Kooy A, Lehert P, et al. Long term treatment with metformin in patients with type 2 diabetes and risk of vitamin B-12 deficiency: randomised placebo controlled trial. BMJ. 2010;340:c2181. 34. Stein J, Stier C, Raab H, Weiner R. Review article: The nutritional and pharmacological consequences of obesity surgery. Aliment Pharmacol Ther. 2014;40(6):582-609. 35. Carmel R. Subclinical cobalamin deficiency. Curr Opin Gastrenterol. 2012;28(2):151-158. 36. Hvas AM, Nexo E. Diagnosis and treatment of B12 deficiency—an update. Haematologica. 2006;91(11):1506-1512. 37. Modi AC, Zeller MH, Xanthakos SA, Jenkins TM, Inge TH. Adherence to vitamin supplementation following adolescent bariatric surgery. Obesity (Silver Spring). 2013;21(3):E190-E195. 38. Brolin RE, Leung M. Survey of vitamin and mineral supplementation after gastric bypass and biliopancreatic diversion for morbid obesity. Obes Surg. 1999;9(2):150-154. 39. Andreu A, Moizé V, Rodríguez I, Flores L, Vidal J. Protein intake, body composition, and protein status following bariatric surgery. Obes Surg. 2010;20(11):1509-1515.